This course provides an introduction to trickling filter wastewater treatment plants. Trickling filter plants have been justified by their low initial cost, low operating and maintenance costs, and relative simplicity of operation. Although the effluent from trickling filter plants of earlier design was of poorer quality than that from activated sludge plants, the performance of trickling filters designed more recently is comparable to that of activated sludge plants. Both processes offer certain advantages, with trickling filters providing good performance with minimal operator care and few, if any, energy requirements. Learn how the performance of trickling filters will be affected by temperature changes in the wastewater and filter films. This course is intended for civil and environmental engineers and other design and construction professionals wanting an introduction to the design and operation of trickling wastewater treatment filters. This course will give environmental and civil engineers and other design and construction professionals an introduction to wastewater treatment using trickling filters. 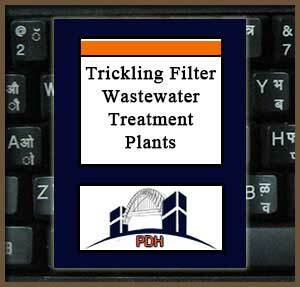 This is an introduction to methods for design and operation of tricking filter wastewater treatment plants. This course will give you technical guidance you can apply when designing wastewater treatment plants using trickling filters. I chose your company because of the price, and I'm certainly happy with that! I am thankful that there is Continuing Education that is so affordable. Thanks for responding! Thank you very much. Appreciate your prompt response. Have a great day. Thank you. I finish a test when I am in a flight for a business trip so when I log in to your website, I can enter all answers.